Hinton published his “Universal Magazine for Knowledge and Pleasure” in London from 1747 till his death. This periodical (like its famous competitors: the “Gentlemen’s Magazine” where John Gibson was doing a lot of the geographic work, the “London Magazine” with Thomas Kitchin as principal cartographer), was a prime supplier of cartographic information for the readers eager to better follow the latest developments in the far reaches of the empire. A fine engraver, Hinton borrowed extensively from existing sources (mostly French or American), to produce quickly the required maps of the sites of war in the Caribbean (like the war with Spain between 1739 and 1743, with the expeditions of admiral Andrew Vernon to Portobello and Cartagena, and the raid of commodore George Anson on Paita); and in the then known “Colonies” (like the seven year war against France & Spain, between 1756 and 1763). 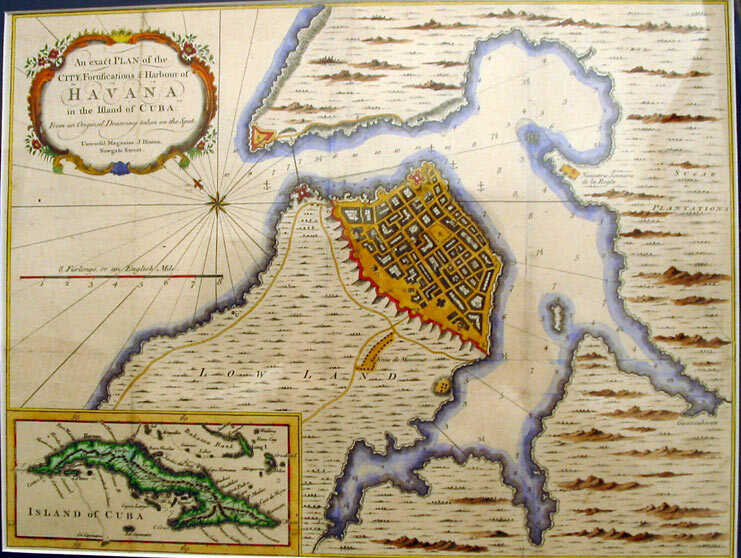 Many maps of La Havana were published in London that year, when the British laid siege to the town and captured it from the Spanish. 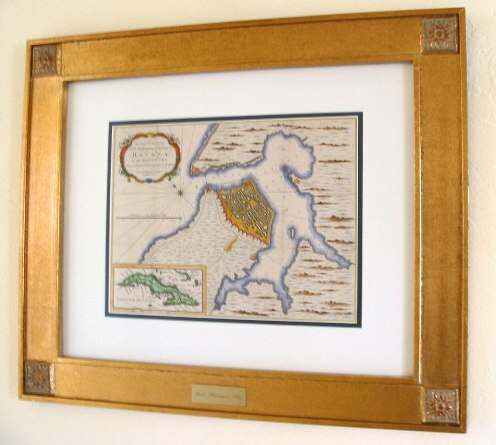 They held onto it for about a year, finally exchanging it against Florida (that is why 1763 was a prolific year for English maps of the peninsula). This map was probably inspired by the 1737detailed work by Homann (heirs). It was published in the Universal Magazine. 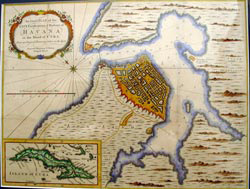 Quite large (13” ¾ X 10” ¼), the map also includes an inset for the whole island of Cuba. The map shows the extensive fortifications erected by the spaniards since the establishment of the city in 1519. Of note, the large fort Morro (key to the harbor), the chain blocking the entrance to the anchorage with fort San Salvador de la Punta at its south end, and the depth soundings throughout the bay. The town streets are shown in detail, but somewhat misplaced. Good margins, except for cropping close to the neat line on about one half of a vertical side.